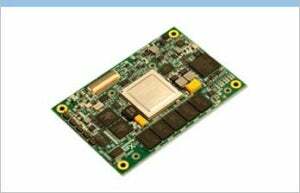 At the size of a business card (55 x 84 mm) and supporting a Freescale QorIQ quad-core P2041 processor, the mini form factor XPedite5650 from Extreme Engineering Solutions (X-ES) is the smallest and among the highest performing COM Express modules available. Designed and tested for the harshest military, aerospace and industrial environments, the XPedite5650 is a rugged and reliable COTS processor mezzanine solution that includes enhancements above and beyond commercial COM Express modules. The Tech Source Condor VC100x is an H.264 compatible video capture XMC card with up to 4 video inputs. The VC100x is optimised for surveillance, image detection, video recording, unmanned vehicles (UAV) and other camera based video recording/analysis applications. Trenton Technology’s BXTS7059 is a single-processor PICMG 1.3 SHB featuring an Intel Xeon E5-2400 series processor developed under the Sandy Bridge-EN micro-architecture. The board supports DDR3-1600 Mini-DIMMs and maximum system memory capacity of up to 48GB. TheBXTS7059 features SAS and SATA/600 ports, multiple I/O and communication interfaces including PCI Express 3.0. Available in conduction- or air-cooled versions, the XCalibur4402 from Extreme Engineering Solutions (X-ES) utilises the processor’s dual- or quad-core technology with Intel Hyper-Threading Technology, making it an excellent COTS solution for military, communications, and industrial applications.